Put the pistachios and confectioner’s sugar in a food processor and process them in 1-minute intervals 3 times. In a mixing bowl, combine the egg whites with the pinch of salt. speed, gradually beat in the sugar and continue to whip until stiff peaks form, about 2 minutes. Sieve the pistachio flour and fold it into the egg whites in two batches, mixing with a spatula just until no streaks remain. This will seem to be a lot of pistachio flour for the amount of egg whites you have, but I promise it will work out. Scrape the batter into a pastry bag with a round tip or do what I did and use a large baggie with a small hole cut in the corner. Pipe 1" circles of macaroon batter about 1" apart on parchment lined baking sheets. Let rest for an hour so the macaroons develop a skin. Bake for 10 minutes at 350 degrees. Allow to cool completely. 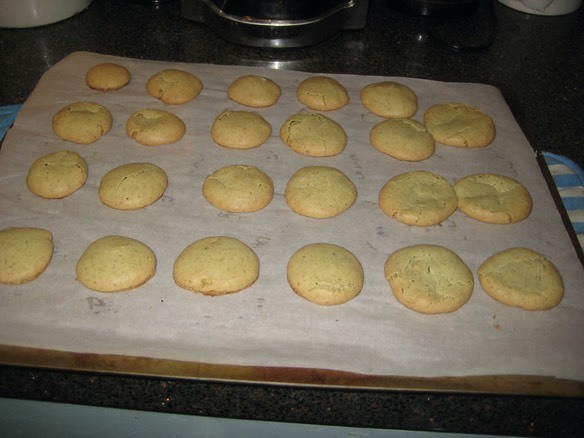 For the filling, process the pistachios and the confectioner's sugar like you did for the macaroons. Add in butter and vanilla and process until smooth. Put filling in a pastry bag or small baggie and pipe onto 1/2 of the macaroons, top with another macaroon and enjoy.